The trainer is enclosed in a metal case, which has a wide experiment printed circuit board (22 cm x 35 cm). This ensures easy handling and good visibility of the components. The components are located on the board, which has a silkscreen print of the analytical circuit and component drawings. The central part of the experiment board includes all the circuit block drawings and the all the hands-on components, test points, and banana sockets. The fixed components are located on the top side of the panel under a sturdy transparent cover. 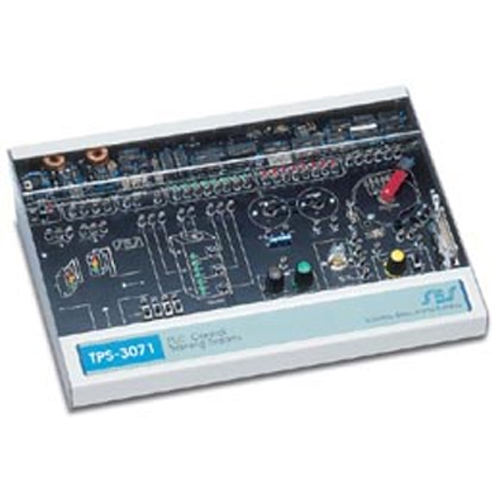 The system includes a built-in power supply with +12V, +5V, and variable DC voltage outlets. An included external low AC voltage power adapter feeds the system. The software can be used as a simulator and can turn the PC into a PLC for the TPS-3071 PLC Control Trainer. This course introduces the student to control application using software control, PLC or microcontroller. The student control sensors and motors performing exercises like traffic light control, elevators control and consumers Application. The course develops basic and advance skills application control. The system is stand-alone, containing all the necessary electronics components needed for performing the experiments. The experiments area is in the central part of the trainer including circuit drawing, test points and peripheral outlets an inlets. The circuit board upper side includes visible components circuits protected by sturdy transparent cover. The system contains traffic light, elevator, motor and dynamo, stepper motor, limit switches, optocoupler, hall effect sensor, temperature and light control modules. The control can be using three options: PLSES Ladder diagram software, an industrial PLC or microcontroller or microprocessor modules.